Even though building materials have significantly advanced, one of the best types of material for building a deck is still pressure treated lumber. It protects the structure with chemicals preservatives that are forced into the wood keeping it safe from insects and moisture decay. If you are going to tackle building your own deck, this material is the most popular way to go. Whether you’re breaking ground this summer or still sketching out the blueprints, it pays to know your options. Five basic types, each with their own aesthetics, maintenance and price range, have emerged. We take a detailed look at each. The widespread popularity of PT lumber isn’t surprising: it’s affordable, readily available coast-to-coast, and easy to cut and fasten with nails or screws. Most PT decking is milled from southern yellow pine, and then chemically treated to resist rot, fungus and wood-boring bugs. The two most common sizes of treated decking are 2 x 6s (90 cents per linear foot), and 5/4 x 6-­in. planks ($1 per linear foot). 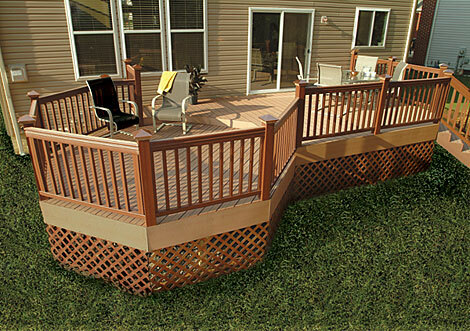 Occasionally 2 x 4s (60 cents per linear foot) are used, but typically only on small decks or railings. This image from This Old House shows the basic structure of a deck. A maintenance free alternative for deck building is using composite material, a combo of two different materials that create a stronger, more durable building product. The downfall for using this type of material is the cost, as it is two to three times more expensive. Making the final decision on what materials to use for your deck requires some online research or consulting with a construction company.